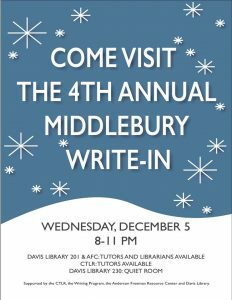 On Wednesday, December 5th, from 8:00 p.m. – 11:00 p.m., supported by the Center for Teaching, Learning and Research (CTLR), the 4th Annual Middlebury Write-In will be held. Students can receive writing assistance from tutors and research help from librarians in Davis Family Library 201 or in the Anderson Freeman Center. Snacks will be served. For more information, visit go.middlebury.edu/writein. This entry was posted in Library News, libspotlight, lisblog and tagged Library Spotlight, libspotlight, write-in on December 3, 2018 by Katrina Spencer.